Your house exterior colors tell your neighborhood about you and your home. Selecting compatible paint colors enables you to highlight the attractive architectural features of your home's exterior and downplay its defects. To be compatible, your house colors should match the neighborhood, the style of your house and each other. 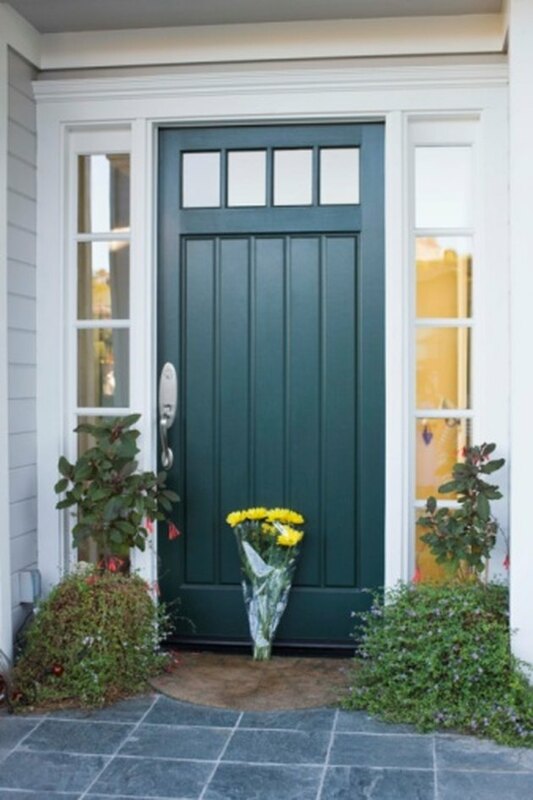 Highlight your front door with a contrasting accent color. A house exterior color scheme has three elements, all of which should be compatible. The body color of your house exterior is the dominant color and is usually on the siding or stucco. The trim color is found on fascias, soffits and window and door frames. The accent color is often a contrasting color, perhaps on the front door. Most neighborhoods have a distinctive look and feel. As part of your neighborhood, the exterior colors of your home should be compatible with this while still remaining distinctive. Study the exterior colors and finishes of homes around you. If most of the homes have pastel or neutral color walls and doors, a dark color exterior will stand out. Alternatively, if your neighbors' houses are decorated vibrantly in bold colors, a beige or pale gray exterior will not fit in. Use the overall look of your neighborhood as a guideline for your main color, but add your own touches in the trim and accent colors. Identify the colors of your house that you cannot change. The roof tiles, any brickwork or stonework, your front path, the driveway and even your fencing have colors that will contribute to your exterior color scheme. Consider also the colors within your front yard. If you have mainly trees and shrubs, green will be a large element in your color scheme. During the summer months, any flowers that grow will add pops of color. if you are in an area that has snow for several months, white plays a role in your color choices. Your exterior house colors should be compatible with the architectural style of your house. The muted, strong colors of Victorian houses do not suit a minimalist, contemporary house. Mid-century modern homes do not suit bright colors, such as pink, purple or lime green, though these colors can be added as accents or accessories, including containers of flowers. Extend your interior decor style and color scheme to the outside of your home to link these two spaces. Introduce your main interior colors to the exterior in the color of your front door, your mailbox or garden ornaments. Colors are compatible if they have some relationship to each other. Warm colors, such as red, yellow and orange, are energetic and lively, and cool colors like blues and greens are calming and create a soothing impression. White, black and gray are neutrals. Colors next to each other on the color wheel are analogous and are in harmony and balance with each other. Complementary colors are opposite each other on the wheel and are contrasting and vibrant. Monochromatic color schemes have different shades of one color, usually a neutral such as white, cream or gray. A house in this scheme appears sophisticated and timeless. Add your own touch to any of these compatible colors by introducing a pop of unexpected color as a contrast.